Paint one paper plate black and the other whatever color you choose. Red is traditional for ladybugs, but you can get colorful like we did if you like. Set aside to dry. While the paint is drying, use scissors to cut different sized circles or ovals out of the black fabric. You will need approximately 12 circles for each ladybug. Set aside. From black felt, cut out half a circle for the head. Once paint has dried, take the color paper plate (not the black one) and cut it in half. Line the two halves up with the black paper plate and spread the "wings" open a bit. Hold at the top and carefully poke a hoe through the top of the wings and through the black plate underneath. Still holding it in place, push the fastener through the hole and secure. Glue the circles onto the colored wings. Glue the head over the top of the wings to hide the fastener. Glue wiggle eyes onto the head. 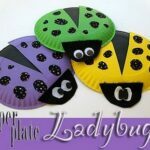 This project for Paper Plate Lady Bugs was printed from CraftsbyAmanda.com - https://craftsbyamanda.com/paper-plate-lady-bugs/ and can only be printed for education or personal use.